Chondroitin sulfate is a sulfated glycosaminoglycan (GAG) composed of a chain of alternating sugars like N-acetylgalactosamine and glucuronic acid. Chondroitin sulfate is a natural chemical component of human connective tissues that is generally found in cartilage around bone joints in the human body. Chondroitin sulfate is generally manufactured from animal source, such as bovine, porcine, shark and other marine sources. Chondroitin sulfate is an alternative medicine for slowing the progression of osteoarthritis, Moreover, it also helps to reduce inflammation and pain. This leads to improvement in joint functions. Chondroitin sulfate is mostly used in combination with glucosamine. Chondroitin sulfate is also used as an eye drop for sore eyes moreover, chondroitin sulfate had the veterinary uses also. The global market for chondroitin sulfate was worth US$ 343.8 million in 2016, with dietary supplements application segment dominating the overall global market. The global chondroitin sulfate market is witnessing a significant growth and is expected to expand at prominent CAGR during the forecast period of 2017–2025. Prevalence of osteoarthritis in many regions, rising awareness towards joint health, introduction of novel chondroitin sulfate combination products etc. has a positive impact on the growth of global chondroitin sulfate market. Religious & cultural impediments on the usage of chondroitin sulfate (Middle Eastern countries) are few of the factors restricting the growth of the global chondroitin sulfate market. The global chondroitin sulfate market is segmented on the basis of application, and source. Based on application, the global market has been segmented into dietary supplement, pharmaceutical, cosmetics and veterinary use. Dietary supplements segment accounted for more than 50% share in terms of value of the global chondroitin sulfate market, in 2016. The segment is anticipated to dominate the global chondroitin sulfate market throughout the forecast period due its application in osteoarthritis treatment. On the basis of source, the global chondroitin sulfate market is segmented into bovine, porcine and others. Bovine source is expected to be the fastest growing segment and is expected to expand at 3%-4% CAGR over the forecast period of 2017–2025 due to shift of preference towards bovine source, also the religious factors limit the usage of porcine source in some countries. Other sources includes chicken, shark and other marine sources. Geographically, North America and Europe are the major regions where revenue is generated from the global market. The U.S, U.K and Germany show high adoption rates for chondroitin sulfate as compared to rest of the world due to rise in awareness amongst people toward osteoarthritis diagnosis, targeted efforts of government and non-governmental organizations towards osteoarthritis management, developed healthcare infrastructure, high prevalence of the disease in the region etc. Developed countries such as Australia and Japan are favorable for the growth of the market. Developing countries like India, Brazil, and Italy shows the potential growth during forecast period 2017-2025. There is less awareness toward osteoarthritis in the under developed countries and the disease is often misdiagnosed which can restrain the growth of the market during the forecast period. Some of the key players in the global chondroitin sulfate market include Sioux Pharm, Inc., Qingdao WanTuMing Biological Products Co., Ltd., TSI Group Ltd., Shandong Runxin Biotechnology Co., Ltd., Pacific Rainbow International, Inc., ZPD A/S. Synutra International, Inc., Summit Nutritionals International, Inc., Yantai Ruikangda Biochemical Products Co., Ltd., Bioiberica, S.A.U. Seikagaku Corporation, and Jiaxing Hengjie Biopharmaceutical Co., Ltd. etc. This report on the global chondroitin sulfate market analyzes the current and future prospects of the market. The report comprises an elaborate executive summary, including a market snapshot that provides overall information of various segments. The research is a combination of primary and secondary research. Primary research formed the bulk of our research efforts along with information collected from telephonic interviews and interactions via e-mails. Secondary research involved study of company websites, annual reports, press releases, stock analysis presentations, and various international and national databases. The report provides market size in terms of US$ Mn for each segment for the period from 2017 to 2025, considering the macro and micro environmental factors. 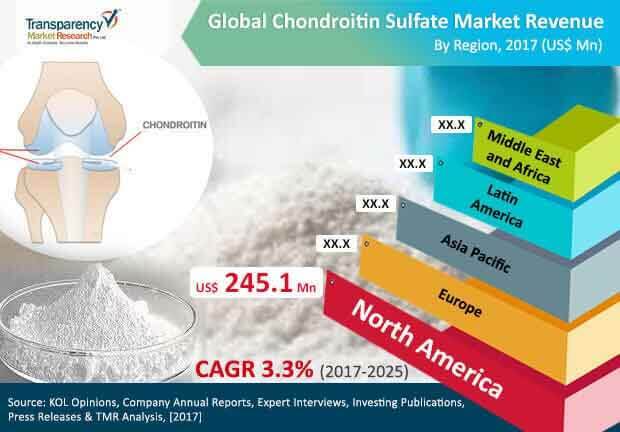 Growth rates for each segment within the global chondroitin sulfate market have been determined after a thorough analysis of past trends, demographics, future trends, technological developments, and regulatory requirements. A detailed qualitative analysis of factors responsible for driving and restraining market growth and future opportunities has been provided in the market overview section. This section of the report also includes market attractiveness analysis that provides a thorough analysis of the overall competitive scenario in the global chondroitin sulfate market. Market revenue in terms of US$ Mn for the period between 2015 and 2025 along with the compound annual growth rate (CAGR %) from 2017 to 2025 are provided for all the segments, considering 2016 as the base year. Market size estimations involved in-depth study of chondroitin sulfate applications globally. Additionally, market related factors such as supply demand scenario of chondroitin sulfate, prevalence of osteoarthritis, aging population have been taken into consideration while estimating the market size. Chondroitin is a naturally occurring compound that provides support for strong, healthy cartilage and joints. The glycosaminoglycan chondroitin sulfate is one of the most vital compounds in connective tissue, responsible for building and supporting the ground substance of cartilage. Based on application, the global chondroitin sulfate market has been segmented into pharmaceutical, dietary supplements, cosmetics and veterinary use. The dietary supplements segment is projected to dominate the market during the forecast period due to growing demand for dietary products. Based on source the global chondroitin sulfate market is segmented into bovine, porcine, others. The bovine segment is anticipated to dominate the market during the forecast period due to easy availability of bovine source, presence of high percentage of chondroitin sulfate etc. Geographically, the global chondroitin sulfate market has been segmented into five regions: North America, Europe, Asia Pacific, Latin America and Middle East & Africa. In addition, the regions have been further segmented by major countries from each region. The report also profiles major players in the chondroitin sulfate market based on various attributes such as company overview, financial overview, SWOT analysis, key business strategies, product portfolio, and recent developments. Key companies profiled in the report include Sioux Pharm, Inc., Qingdao WanTuMing Biological Products Co., Ltd., TSI Group Ltd., Shandong Runxin Biotechnology Co., Ltd., Pacific Rainbow International, Inc., ZPD A/S, Synutra International, Inc., Summit Nutritionals International, Inc., Yantai Ruikangda Biochemical Products Co., Ltd., Bioiberica, S.A.U., Seikagaku Corporation and Jiaxing Hengjie Biopharmaceutical Co., Ltd.